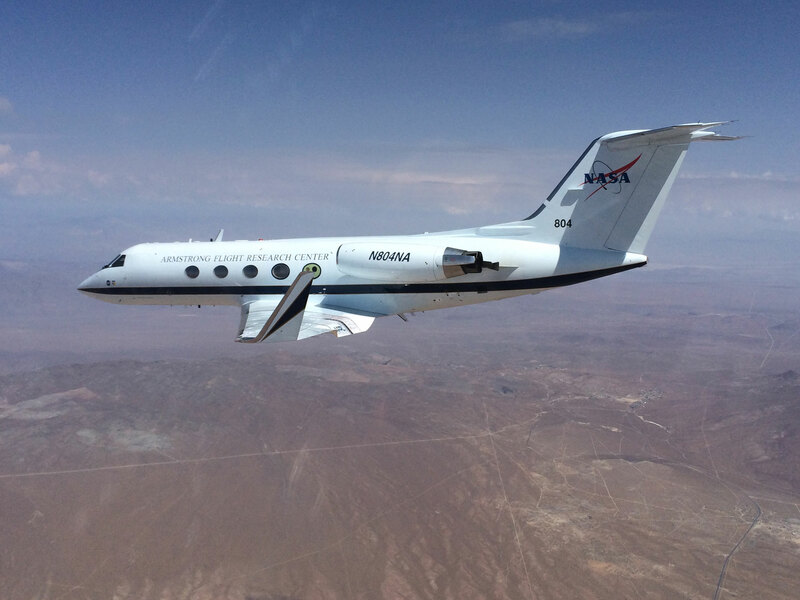 A team of NASA researchers, working with the Air Force Research Laboratory (AFRL) and FlexSys of Ann Arbor, Mich., successfully completed initial flight-tests of new morphing-wing technology on a Gulfstream III, NASA announced yesterday. The technology has the potential to lower fuel burns, reduce airframe weight and cut aircraft noise during takeoffs and landings, it said. Project researchers at NASA’s Armstrong Flight Research Center in Edwards, Calif., replaced the twinjet’s conventional aluminum flaps last summer with shape-changing assemblies that form continuous conformal surfaces with no visible gaps. The test team conducted 22 flights from Edwards over the past six months with the experimental adaptive compliant trailing edge (ACTE) flight control surfaces at flap angles ranging from -2 degrees up to 30 degrees down. Although the FlexSys ACTE flaps are designed to morph throughout the entire range of motion, each test was conducted at a single fixed setting to collect incremental data with a minimum of risk, according to NASA. “We are thrilled to have accomplished all of our flight-test goals without encountering any significant technical issues,” said AFRL program manager Pete Flick. “These flights cap 17 years of technology maturation.” All the primary and secondary objectives for the test were successfully completed on schedule and within budget. Results of the flight-tests will be used to help design future aircraft, though ACTE technology can also be retrofitted to existing airplane wings, NASA said. According to FlexSys, ACTE flight control surfaces can reduce fuel consumption by 3 to 5 percent on retrofits and 8 to 12 percent on clean-sheet designs, as well as reduce noise and takeoff by up to 40 percent.